THERE ARE QUITE A NUMBER OF PAGES BEING POSTED ON MY SITE WHICH ARE SO LARGE THAT THEY HAVE TO BE POSTED IN A SIZE WHICH RESULTS IN A RESOLUTION THAT RENDERS THE TEXT ILLEGIBLE. I HAVE FOUND A FREEWARE (100% FREE) DOWNLOAD WHICH WILL DO A PRETTY NICE JOB OF ZOOMING IN SO THE TEXT CAN BE READ. IF YOU DECIDE TO DOWNLOAD IT. GO TO THE MENU AT THE TOP OF THE SCREEN AND CHOOSE "ZOOM." IT WORKS WELL FOR ME AND I HOPE IT WILL BE AN ASSET FOR THOSE WHO NEED READABLE TEXT. IF NOT, IT IS EASY TO REMOVE FROM YOUR SYSTEM. 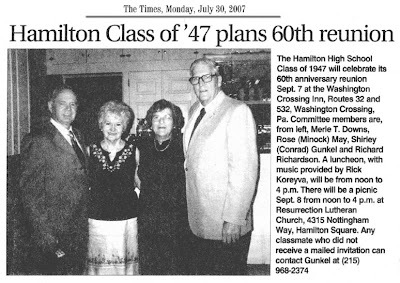 2007: HHS '47 PLAN THEIR 60TH! 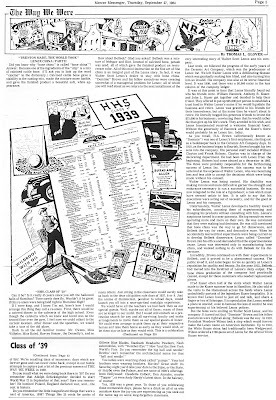 HEREWITH UP TO DATE ON THE STATUS OF THE CLASS OF HHS47's 60TH REUNION. YOU CAN ALSO FIND A NUMBER OF POSTS ON MY WEBSITE ON THIS CLASS....ANOTHER HORNET CLASS WITH CLASS! GO TO THE UPPER LEFT OF THIS SCREEN AND DO A SEARCH. (TRY SEARCHING USING THIS STRING: ('47) WITHOUT THE (). 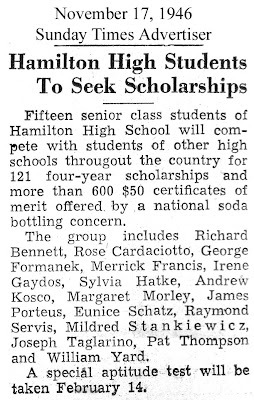 THANKS TO JACK LACY, HHS '56, THIS NOTIFICATION OF ANOTHER OF OUR HAMILTON HORNETS WHO HAS PASSED ON. Robert M. Turkington Sr. Mercerville - Robert M. Turkington Sr., 69, died Tuesday at his home. 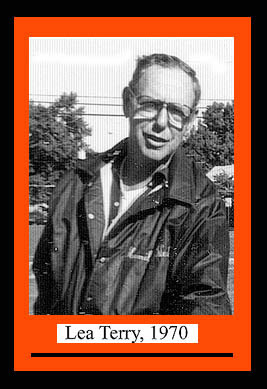 Born in Trenton, he was a lifelong area resident. Mr. Turkington was a lifelong member of Bakery Drivers and Salesman - Local 194, retiring as a driver in 2000 from Maier's Bakery. He was an avid outdoorsman. He loved hunting, fishing and spending time in his garden. Most of all, he loved spending time with his family. Son of the late Russell and Lillian Young Turkington, father of the late David J. Turkington and brother of the late Marilyn Diehl, he is survived by his wife Eleanor (Ketterer) Turkington; four sons and their wives, James and Brenda Turkington, Robert M. Jr., and Debbie Turkington, Shawn and Maureen Boyer and James and Sasha Boyer all of Hamilton; six grandchildren, Kevin, Kelly, Brianna, Matthew, Shawn Jr., and Ashley; two nieces, Sally Stevens and Kathleen Cokenakes; one nephew, Steve Worth; and his loving companions Tiffany and Rambo. Funeral service will be 10 a.m. Friday at the M. William Murphy Funeral Home, 1863 Hamilton Ave. Entombment will be in Greenwood Cemetery. The family will receive friends Friday from 9 a.m. until time of service at the funeral home. 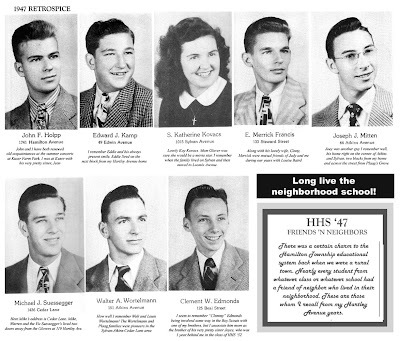 THESE ARE A SELECT FEW OF MY "NEXT DOOR NEIGHBORS" FROM THE CLASS OF 1952 AT HAMILTON HIGH. 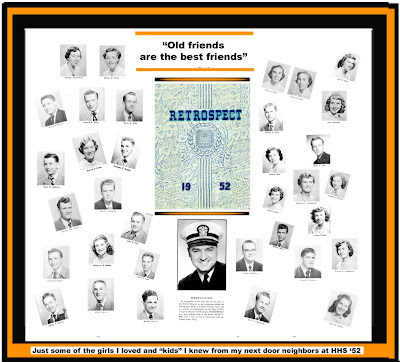 AS I PAGED THROUGH THE 1952 "RETROSPECT" YEARBOOK, I PONDERED ON EACH AND EVERY PICTURE, RECALLED AN INCIDENT OR TWO WHICH RELATED TO MY RELATIONSHIP WITH THAT PARTICULAR PERSON, AND ADDED HIM OR HER TO THIS VIGNETTE. I INCLUDED THE PHOTOS OF THE GIRLS I LOVED, THE GIRLS THAT WERE THE SUBJECT OF MY NUMEROUS TEEN AGE CRUSHES, THE GUYS I KNEW, FONDLY RECALLING THE GREAT TIMES WE HAD PLAING UNSUPERVISED GAMES OF BASEBALL AT PLAAG'S GROVE, USUALLY WITH A BASEBALL RE-WRAPPED WITH FRICTION TAPE, AND A BRICK OR A TIN CAN LID FOR BASES. 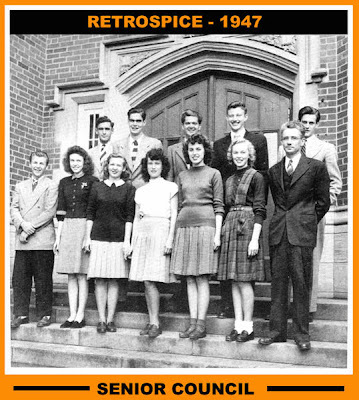 I PAUSED AN EXTRA MINUTE OR TWO AND RECALLED THAT HANDSOME NAVY OFFICER, HAROLD BILLS, TO WHOM THE CLASS DEDICATED THE 1952 YEARBOOK. I RECALL THE LOOK ON THE GIRLS' FACE WHENEVER HE ENTERED A CLASS ROOM DRESSED IN HIS NAVY OFFICER'S UNIFORM. Hi Jack...FYI...Ginny and Lea Terry were in a serious auto accident in Penna. 2 weeks ago, near Bowman's Hill. Lea was driving and they were hit broadside on the passenger side. Lea was just banged up- no fractures or serious injury. Ginny, however was admitted to intensive care in St. Mary's in Newtown with bruised bladder and heart, concussion, and 22 fractures including ribs, pelvis, right scapula. She is now at Care One of Ewing on Parkway Avenue. Organs are fine now--just having daily physical therapy. They are not allowing her to walk at all but do get her up on her feet to the bathroom in a wheelchair. I visited tonight and there is no estimate of how long they will keep her there but a stay at St. Lawrence rehab. seems to be a possibility. Lea is at home and his kids are transporting him back and forth to Ewing. She is, of course, very uncomfortable but being a real trooper. Having kept herself in good physical shape swimming and walking has been very much in her favor. "THE MUSIC WE GREW UP WITH!" EVEN THOUGH THE MEDIA IN GENERAL PREFERS TO CATER TO THE YOUNGER GENERATION, WE IN THE SENIOR CITIZEN COMMUNITY STILL RECOGNIZE GOOD MUSIC WHEN WE HEAR IT....WE CAN ACTUALLY UNDERSTAND THE WORDS! 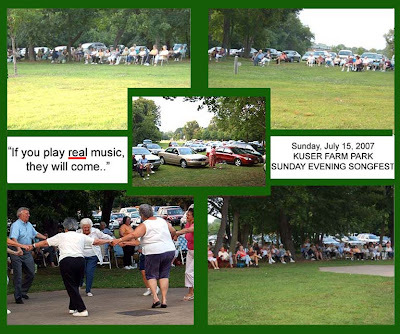 THIS GRAPHIC IS A VIGNETTE OF THE SUNDAY, JULY 15, 2007 KUSER FARM CONCERT WHERE MORE THAN 100 OF OUR CITIZENS CAME FOR AN EVENING OF LISTENABLE MUSIC. SON TOM JR. AND I WILL BE "BACK ON THE FARM" EACH SUNDAY AFTERNOON FROM 6 TO 8, WEATHER PERMITTING. REUNION. IN A POST PRECEEDING THIS ONE, I COMPOSED A PHOTO VIGNETTE OF SOME OF THE FOLKS I KNEW FROM THIS CLASS IN MY HARTLEY AVENUE NEIGHBORHOOD. 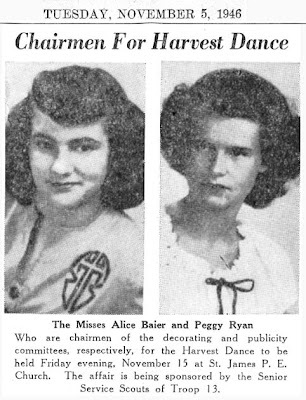 These two lovely ladies were an integral part of the activities of St. James P.E. church, which was once located on the southeast corner Greenwood and Logan Avenues. 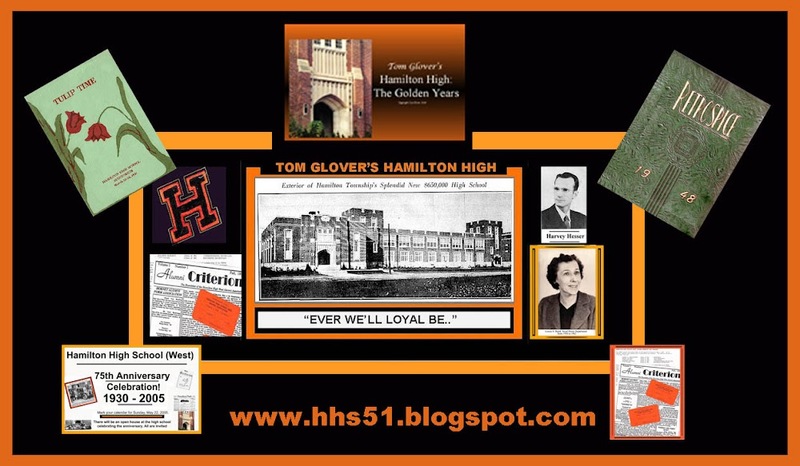 Both are alumni from Hamilton High's Class of '48.